Summary records are temporary records used for calculating totals, subtotals, and other summary information. You don’t create summary records yourself, instead, Panorama automatically creates them for you when you tell it to divide the database into groups. When viewing the database as a sheet you can identify summary records by the light green background color. Summary records may be created in up to seven levels, from 1 to 7. 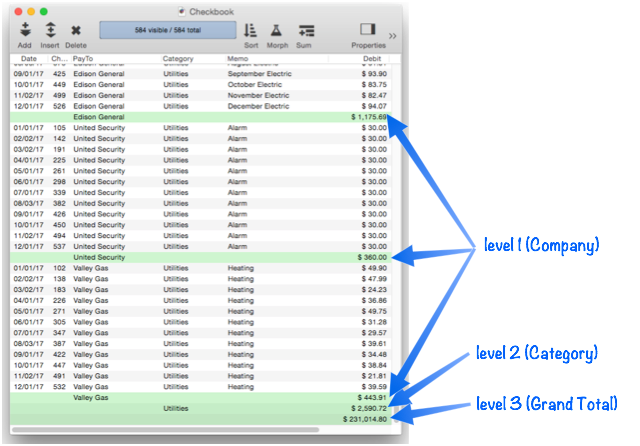 Each higher level is used for a higher level of subtotal. Each summary level can be identified by the deeper shade of green in the background, as shown here. This database has been grouped into two summary levels (plus the grand total). Panorama allows you to treat summary records as a collapsible outline. You can use Panorama’s outlining commands (see Expanding and Collapsing the Summary Outline) to collapse the outline to show only high level summaries, hiding the detail. You can also expand and collapse individual sections of the outline to reveal specific details. Summary records are designed to have a very short lifetime—usually only a few minutes. 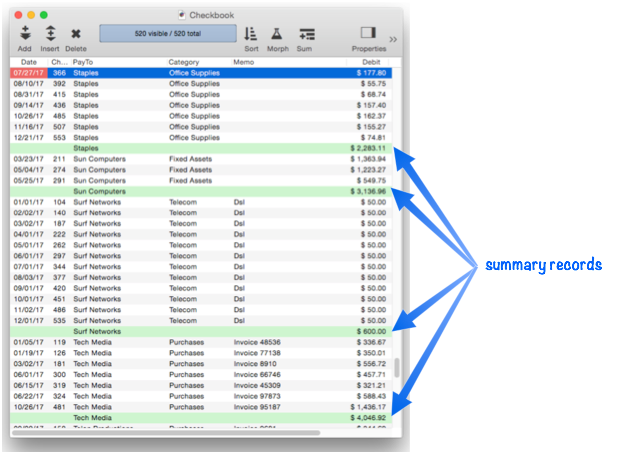 When you want to calculate subtotals or other summaries you‘ll create new summary records. After you’ve examined (and possibly printed) the summaries, you’ll use the Remove Summaries command to remove them so you can get back to regular work with your database (see Deleting All Summary Records).